Postal III is a third-person shooter video game developed by Running with Scissors In Postal III, The Postal Dude emigrates to Paradise's sister town of Catharsis as he previously blew up Paradise with a nuclear bomb. Due to the economic meltdown, the Dude drives into town and becomes stranded because he can not afford a tank of gas. He must then find work and do various odd jobs to escape the town. Through the course of the game, the player can chose one of two paths: the "bad path", which includes joining in on the schemes of Mayor Chomo and Uncle Dave, or the "good path", which involves the Dude joining the Catharsis Police force. The game will play out in a fairly linear and cinematic way, although the player's actions will affect the outcome of the story and the game. Although the "good path" will be more difficult to play, it will offer more story line and a longer campaign. Work got you down? Is the world being unfair and seemingly indifferent towards you? Need to vent some anger? 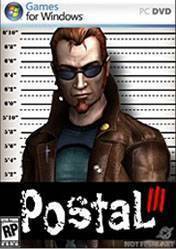 From the cult FPS classic Postal and Postal 2, comes the last installment Postal 3. Weather you are shooting up the neighborhood, raiding the local shopping centre or just feel like beating people with a shovel, Postal 3 has got you covered. So try it today, and stick it too...well...everyone. Absolutely hilarious game :D Buy if you liked the previous games. Now this game is not at the level at its precursors but still these series is one of a kind in the industry !